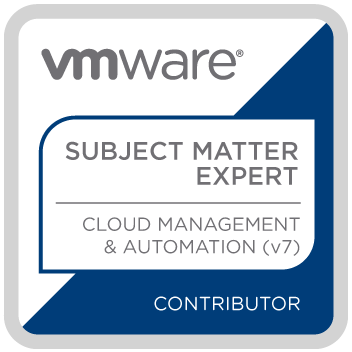 The VMware Certification Subject Matter Expert (SME) for vRealize Automation 7.x is an individual that helps VMware develop certification exams that, in response to changing technological trends, validates the skills of an individual to be qualified to work with vRealize Automation 7.x. An IT professional that has deep technical knowledge and experience with VMware Cloud technologies and works with customers architecting, designing and implementing vRealize Automation 7.x solutions. Contribute to VMware certification exam development by participating in one or more workshops (e.g. job-task analysis, item writing, technical review or standard setting).